My purchase of a new OLED television and then a new AV receiver meant it was time to revisit the remote control situation at Meador Manor. And, as usual, that meant spending time and money on a new solution to an an old problem. In 2007 I purchased a $128 Logitech Harmony 880 Remote Control to operate my system. That universal programmable remote, with its programmable display keys, allowed me to just press one button to turn on the television and receiver, along with any other devices, set each to the appropriate inputs, and control the system. 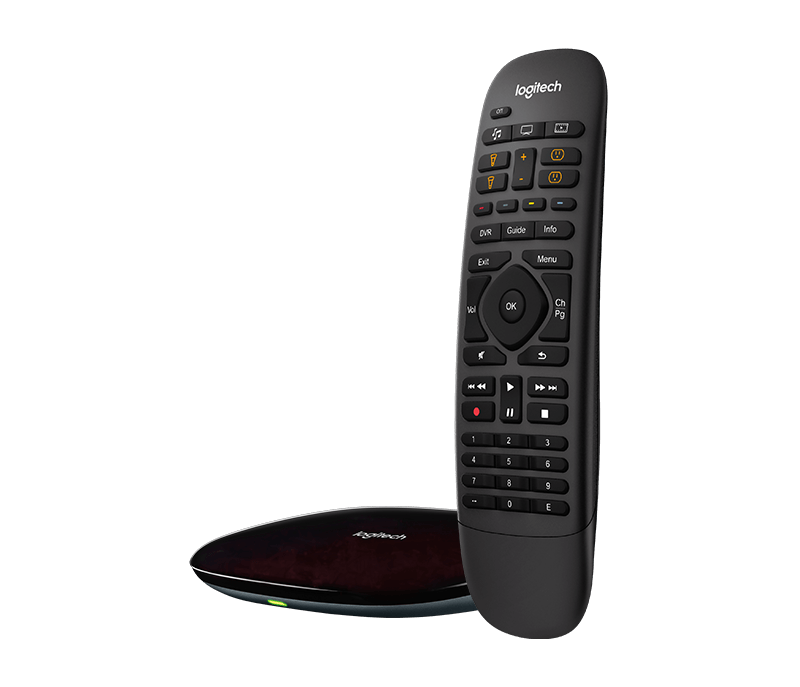 Thus it allowed me to avoid relying on five different remote controls, although I still needed a dedicated Voice Remote to use the Amazon Fire TV Stick, since it relied on radio rather than the infrared signals the Harmony 880 could produce. As I changed out devices over the past decade, I would hook the remote up to my old MacBook Air laptop to reprogram it, customizing various options and buttons. I had to replace its rechargeable battery pack once over the years. I painstakingly reprogrammed the Harmony 880 when I installed the new television and AV receiver. That meant hooking it via USB to my old MacBook Air, which has the outdated programming software on it, to change out devices and adjust activity settings. I also had to aim the new television remote at one end of the Harmony in order to teach it various command codes, since the old database for that remote no longer kept up with the latest components. However, no matter how much tweaking I did, I could never get it to reliably power on the devices, set them to the appropriate inputs, and get the sound set the way I wanted. It kept getting one or more of the variables out of sync. The old remote could actually control each device, but it couldn’t reliably track system status and sequencing. After spending a lot on the new television, receiver, and Apple TV 4K, I wasn’t in the mood to spend a fortune on a really fancy universal remote. But I also couldn’t merely rely on the LG Magic Remote that came with the television. While the HDMI-CEC connection gave it control of the receiver, it still could not control the Blu-Ray player, Apple TV, or Sony VCR. 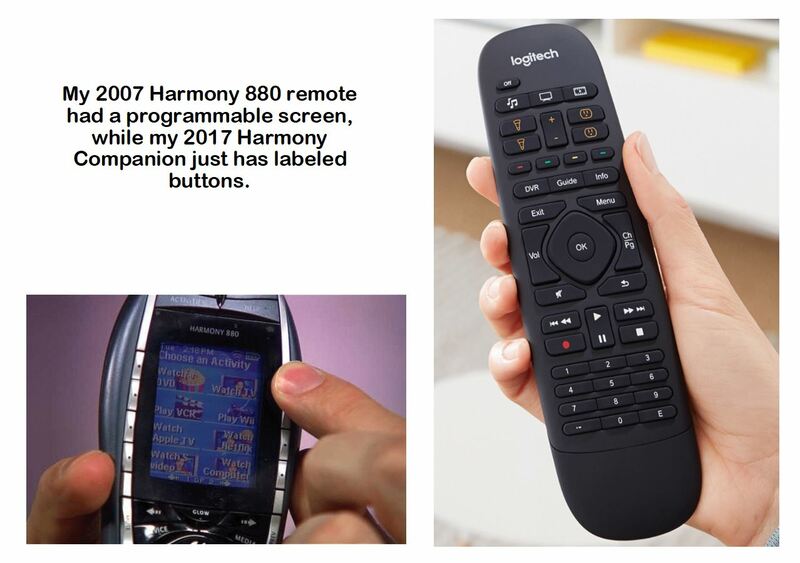 I found that Logitech now offers, at the same $130 price point as my Harmony 880 in 2007, a two-piece Harmony Companion remote control system. It consists of a powered hub and a handheld unit which, unlike the old single-piece 880, doesn’t have a screen. I decided that could be a worthwhile tradeoff since that means the Companion’s handheld unit can reportedly can run off its CR 2032 lithium cell for months, since it has no screen to power and only communicates with the plugged-in hub. That sounded nice, compared to having to remember to set the older and bulkier 880 remote into a charging station every week or so. And for some years I’ve had to jiggle and press it to get it to actually connect and charge. 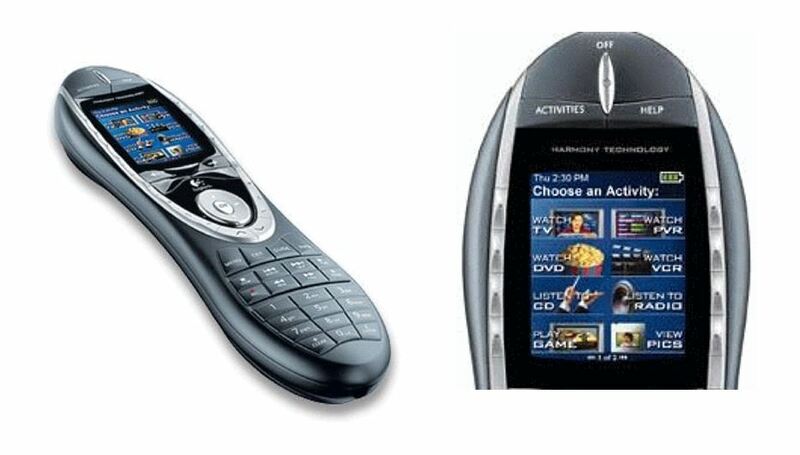 So I bought a $130 Companion remote system rather than dropping $300 to get the Harmony Elite, which sports a programmable screen on its handheld unit. The separate hub plugs into AC power and sits in my cabinet on top of the Blu-Ray player. It blasts IR signals out into the room, which bounce off everything and reflect to control the television, receiver, Blu-Ray player, Apple TV 4K, and old VCR. The system includes a wired IR blaster you can also connect and place strategically if you need to place the hub itself in a closed cabinet. The hub also handles WiFi and Bluetooth signals, so I was able to program the system wirelessly with a Harmony app on my iPad, rather than having to connect it via a USB cable to a computer like I had to do with the 880. The Harmony app is available for both iOS and Android tablets and smartphones. It was simple to plug in the hub and use the iPad app to connect it to WiFi. Programming it to identify my devices was as simple as inputting the manufacturer and model of each one. However, I found that it could not control the old Sony SLV-N81 VCR except to power it on and off. I couldn’t complain too bitterly, since that VCR dates back to 2001. I used the iPad app to manually teach the system the basic commands by selecting a button on the Harmony remote to be programmed and then pressing the matching button on the VCR’s own remote while aiming it at the top of the hub, repeating the process for each command. Three buttons on the remote trigger the specific activities via short and long presses. I do miss the ability to select a device for manual control while in the midst of an activity, something the 880 could do, but I’ll learn to grab my iPhone or iPad for that when needed. And I was happy to be able to install the Harmony app on Wendy’s iPad, since that will make controlling the system less cryptic for her with its labeled activities. I was able to set up the various activities, and by adding a few delays and extra commands here and there I was able to get everything to work well. I was gratified to find I again had single-remote control over everything in the system, able to press a single button to begin or end various activities. There are also six Smart Home buttons on the remote which are labeled for use with Philips Hue bulbs, programmable outlets, and the like. So I could theoretically put some of my Hue bulbs in the living room lamps and have them automatically adjust for various activities, or use a programmable outlet to control a lamp. Our home automation consists of Amazon Echos in the kitchen, office, and bedroom, one Philips Hue bulb in the lamp on my nightstand, and an old wired programmable thermostat. Wendy has made it clear that she’s reached her limit on home automation, so I haven’t added any more Hue bulbs nor programmable outlets. Consequently, we have no use for the Harmony Companion’s Smart Home features. If you want to control a system of devices from different manufacturers with a single remote control, the Logitech Harmony Companion will do the job if you also have access to a tablet or smartphone.